Thanks to you, this village now has access to clean and safe drinking water. They’ve also been trained by our local partners on safe hygiene practices and basic maintenance of their water project. Each family using the new water source contributed toward their project’s construction — a small fee, but one that helps instill a sense of personal ownership for the project. Each family will continue to pay a small amount to use the water; the community will save this money for any necessary maintenance and repairs. The people here, especially women and children, used to walk up to two hours to collect water for their families. Even then, each family member had to make do with about five liters of water per day for drinking, bathing, cooking and everything else. The water wasn’t safe to drink and often made people sick. Thanks to your help, people here are walking significantly less every day to collect water. This means each family now can use up to 15 liters per person per day! Most importantly, the water they bring home each day is safe enough to drink. Note: We wanted to show you that this community is serious about keeping their project safe, clean and functioning for years to come. They built a fence on their own initiative, to prevent animals from contaminating the area and to show ownership of their new water source. Note: Our partners visit water projects (and snap photos) during and after the 18 months of construction. We thought you’d like to see as much of your project as possible… so we included all the photos we could! The landscape might vary; that’s because this area has a lush rainy season and a dusty dry season. Don’t worry — we’ve made sure that these are all pictures of the same project. This is great news! 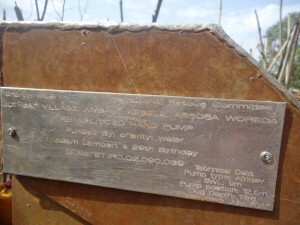 It’s wonderful to see Adam’s name spanning farther than the music or gossip pages. This is terrific. First I’ve heard or seen of this plaque. When did it get dedicated? I hope Adam knows about it. I wish IDOL could have shown this when they did the “Where are they now” on the show this year. I’m not sure when it was dedicated, but I posted it the same day I got the email! Great job. Proud of Adam and your team effort. there’s definately not enough attention paid to Adam’s vast charity work…it’s a shame that others don’t know of his generousity…I think they would be surprised. ADAM is such an amazing human being. I hope he truely comprehends how far reaching his inluence is. He influences the world on a major scale and he also influences the individual on a personal scale. When I think of how big ADAM’s heart is I get choked up! Adam is a rarity among current music stars; he cares about everybody else and does not seem to be in it just for money and fun. I admire him so much as a person and I love his personality almost as much as his beautiful voice, Everyone should know about him !!! !It is nice to hear about the water project ; thanks for posting that;(( 29 dollars was a lot for me then ) but glad to do it for him. I hope the world learns about Adam. It seems like he is actually appreciated more all over the world than he is here anyway.So strange that this country does not totally realize one of their greatest talents EVER>!!!!! This makes me even happier that I donated to this cause !